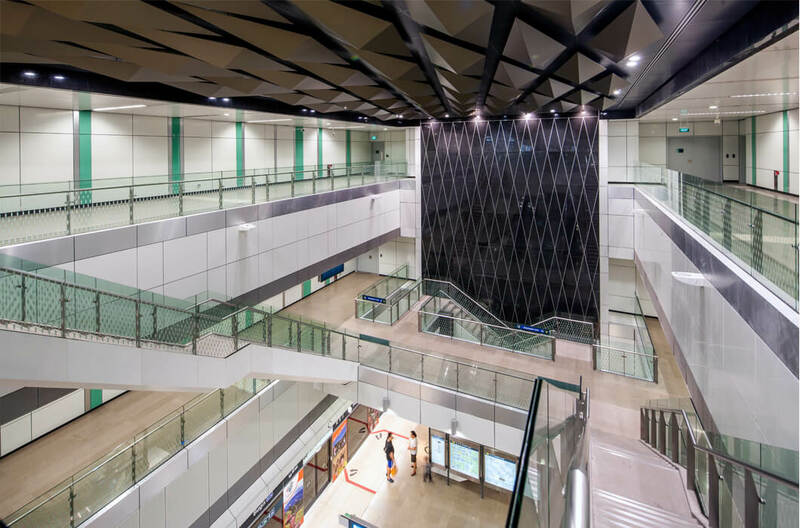 Bugis MRT Station in Singapore has won the Best Design Rail / Road Infrastructure – Project Partner award at this year's Land Transport Excellence Awards (LTEA). Organised by the Land Transport Authority of Singapore, the award ceremony was held on 17 April at Shangri La Hotel in Singapore. The award was presented to Aedas as the project design architect and our partner engineer Arup Singapore. Bugis Station, part of the Downtown Line which passes through the new Marina Bay Downtown, is a three-level interchange station. It is 26 metres deep and characterised by its atria, column-free spaces and underground pedestrian connectivity. The design intent for the station architecture was to give it a strong identity and establish a strong architectural language, setting the station as a unique and recognisable facility. The station’s concourse, mezzanine and platform spaces are connected by a column-free atrium standing at 18 metres high. The vertical space is emphasised by an end-wall finished in artwork. With its column-free structure, passengers get visual clarity of the station’s spaces, enhancing their movement within the station. "We are very proud that we have won the LTEA for the second time," said Kevin Jose. "Our experience in designing transport nodes around the world, combined with our thorough understanding of the local context, enables us to design stations that are not only functional, but also promote a sense of place specific to its environment." In 2012, Aedas-designed Marina Bay Station also won the LTEA for Best Design Rail / Road Infrastructure.